I had the pleasure of hosting Jeffrey Moussaieff Masson at a conference some years ago at Farm Sanctuary. He’s as down-to-earth as the animals he depicts in his books on animal sentience. 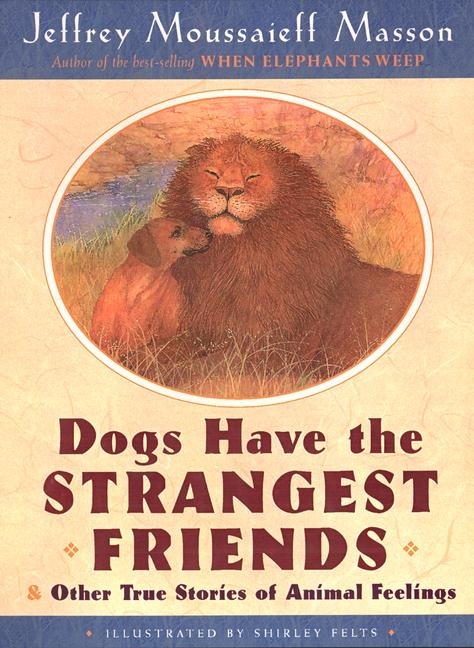 Most recognized for When Elephants Weep and Dogs Never Lie About Love, Masson is a committed animal advocate and vegan and that shines through in Dogs Have the Strangest Friends, a children’s compilation recounting the unique bonds animals have had amongst themselves. 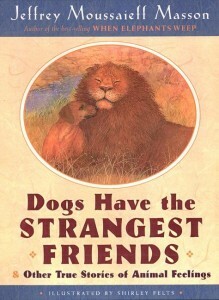 Readers will dive into these stories that depict the emotional world of animals: an elephant who comes to the rescue of a rhinoceros, a mother cat who saves her kittens from a burning building, a peregrine falcon who mourns the loss of his mate while trying to care for his young, and many other touching anecdotes. Kids will inevitably learn (if it wasn’t already apparent to them), that animals are just as self aware, kindhearted, giving, and expressive as human beings. Shirley Felts’ soft, beautiful watercolor images compliment the text nicely. Another must have for the bookshelf.